1. Department of Emergency Medicine & Medicine at the Royal College of Surgeons, Ireland. 2. Graduate Entry Medical School, Royal College of Surgeons, Ireland. 3. Mid-Leinster General Practice Training Programme, Ireland. 4. S.A. Research Consulting, Dublin, Ireland. 5. Department of Emergency Medicine, Connolly Hospital Blanchardstown, Ireland. To assess handover quality amongst Emergency Department (ED) physicians and improve quality by implementing a unique protocol entitled ‘TAG, You’re It!’ (TAG protocol). Patient charts assessed using set parameters prior to implementation of the ‘TAG’ protocol. ‘TAG’ protocol developed based on gaps in current practice and recommendations from literature. Identical parameters applied post-intervention, and results compared to those pre-intervention. ‘TAG’ protocol yielded positive impact on ED handover practices. A significant difference (p<0.05) between pre and post-TAG intervention values was seen across all parameters i.e. including the accepting physician’s name in the computer system and ED chart, documenting a handover plan in the ED chart, and including a handover plan deemed sufficient by standards developed from relevant literature. Shift-to-shift handover in the ED is a high risk time for patient safety. The ‘TAG’ protocol ensures that essential information is documented and communicated in a succinct and rapid way. It has been well-established that patient care handover during shift change in the Emergency Department (ED) is a time in which preventable errors can occur1, 2. In fact, the National Emergency Medicine Programme recommends that standard protocols are developed, and that handover of care be documented appropriately3. Patient handover at shift change are a ubiquitous and potentially hazardous process in emergency care14. As crowding and lengthy evaluations become the standard for an increasing proportion of Emergency departments, the number of patients handed off will likely increase. It is critical now more than ever before to ensure that handover supplies valid and useful shared understandings between providers at transitions of care. Handover failures can lead to delays in treatments4, medication errors5, unnecessary duplication of assessments6 and poor patient experience7. Handover in emergency care is a particularly vulnerable activity, because practitioners need to take decisions based on brief patient encounters and in situations of great uncertainty, time pressure and departmental overcrowding8.When sentinel events occur, communication errors are deemed to be the root cause in about 70% of cases9, 10. In addition, 84% of treatment delays are later judged to be due to miscommunication. Of these, 62% are continuum-of-care issues associated with shift changes11. Several institutions have recognized the trend of reduced errors with improved safety. Many of these have therefore attempted to decrease risk by establishing a standardized protocol that ensures critical information is transferred to the accepting physician during handovers within the ED12, 13. Although certain well known acronyms have been employed, for instance, ISBAR employed in some EDs13, these are frequently time-consuming and lack significant components, such as documentation of referring/accepting physician, bedside physician-patient introduction and are not specific for Emergency Departments. The first part of this project aimed to characterize the current state of handover documentation in Connolly Hospital ED, located in Dublin, Ireland. 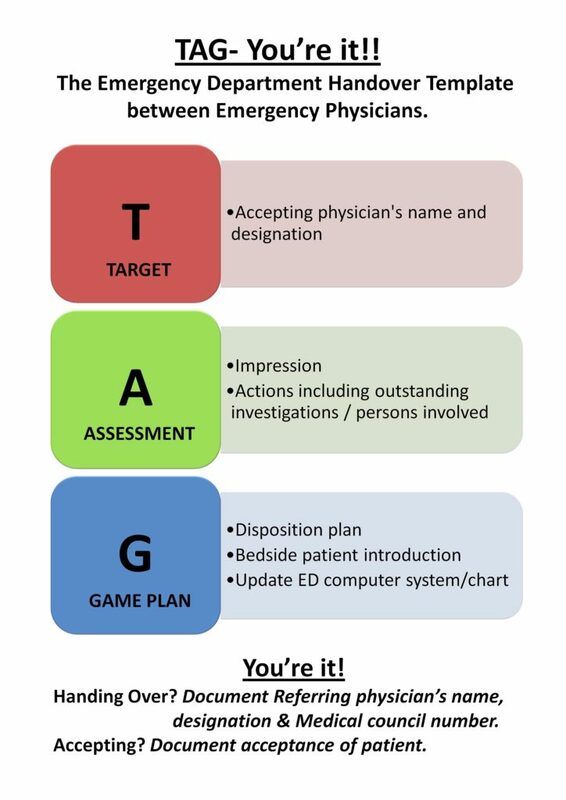 After identifying missing components in current handover practice, we developed a new proposed standardized protocol defined by the acronym ‘TAG (Target, Assessment, Game Plan), You’re it!’. To our knowledge, this is the first of its kind protocol developed in Ireland for ED Physician handover. Using standardized ‘TAG’ protocol led to a significant improvement in handover practices in the Emergency Department. The ‘TAG’ handover protocol requires sufficient documentation, and is feasible in the time-sensitive, and often hectic, environment of ED. Following department-wide training on the ‘TAG’ Protocol, we analysed adherence by comparing pre-TAG and post-TAG intervention results. A study was conducted in the Emergency Department of Connolly Hospital, Blanchardstown, Dublin 15, Ireland. The Emergency Department of Connolly Hospital is an urban, tertiary service providing 24/7 care to all adult patients, 16 years of age and older, presenting with acute undifferentiated illness or injury. Connolly Hospital is a major teaching and health promoting hospital providing a range of services to a diverse population covering the communities of West Dublin, North Kildare and South County Meath. It serves a catchment population of 330,000 people. An ED patient chart review was performed in Connolly Hospital. Based on times encompassing peak handover hours (8AM, 5PM, 8PM), 200 patient charts were randomly extracted and reviewed for handover occurrence for the month of September 2017. Emergency Department patient chart information was accessed using the ED electronic database, ‘Symphony’. The physician’s documentation was screened for essential handover elements as per previous literature14-17. In the present study, a handover plan was deemed sufficient if the referring physician’s handover included adequate details of the patient’s working diagnosis, outstanding investigations, healthcare professionals involved, and management plan to be followed by the accepting physician. The accepting physician’s name and designation was to be documented on the ED chart. In addition to documentation of the accepting physician’s name, we have reiterated the importance of documenting the Medical council number to the signature of the accepting physician, which is standard practice. The referring physician has to document a clinical impression, actions including outstanding investigations/consultations in the ED patient chart. This involves documenting the patient disposition plan, bedside physician-patient introduction, updating the ED computer system and ED patient chart with name of the accepting physician. Handing over? Documenting the referring physician’s name, designation and Medical council number. Accepting? Document acceptance of patient. The ED doctors of Connolly Hospital were trained on application of the ‘TAG’ handover protocol during multiple teaching sessions in March 2018. As memory aids, laminated ‘TAG’ posters were posted around the Emergency Department (Figure 1). Additionally, the ‘TAG’ Protocol was incorporated into the Connolly Hospital ED non-clinical guideline folder for all ED physicians to adhere. A second audit, post-TAG was commenced in May 2018. Charts were reviewed between April and May 2018. Two hundred and fifty patient charts were randomly extracted and reviewed for handover occurrence. 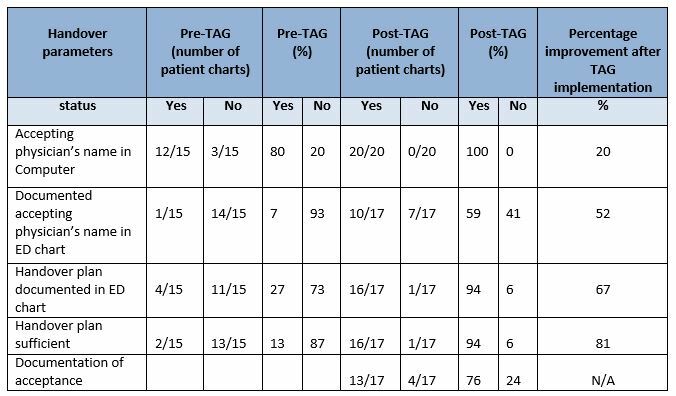 Identical handover parameters of screening were applied, and results from this audit were compared to those pre-TAG Protocol implementation (Table 1). A total of 200 patient charts were randomly reviewed in September 2017. Of these, 15 charts contained indication of a handover. Handover documentation review revealed the following: 80% (12/15) of charts included the name of the accepting physician in the computer system; 7% (1/15) of charts included the name of the accepting physician in the scanned handwritten chart; 27% (4/15) of charts included a clear patient management plan for the accepting physician, (2/4) of which contained sufficient handover information as dictated from previous literature. A total of 250 charts were randomly reviewed between April and May 2018. Of these, 20 charts had indication of handover. 100% (20/20) charts included the name of the accepting physician in the computer system. However, 3/20 written ED handover charts were not accessible for review for post-TAG audit. Of the 17 ED handover charts; 59% (10/17) of charts included the name of the accepting physician in the scanned handwritten chart; 94% (16/17) of charts included a clear patient management plan for accepting physician, 94% (16/17) of which contained sufficient handover information. An additional parameter included documentation of acceptance from the recipient physician, which was included in 76% (13/17) of management plans. A paired t-test statistical methodology was conducted to analyse the difference between the pre-TAG handover parameters and post-TAG handover parameters, Table 1. The study determined a p value =0.025, CI 95%, indicating that the implementation of the ‘TAG’ protocol made a significant positive impact. 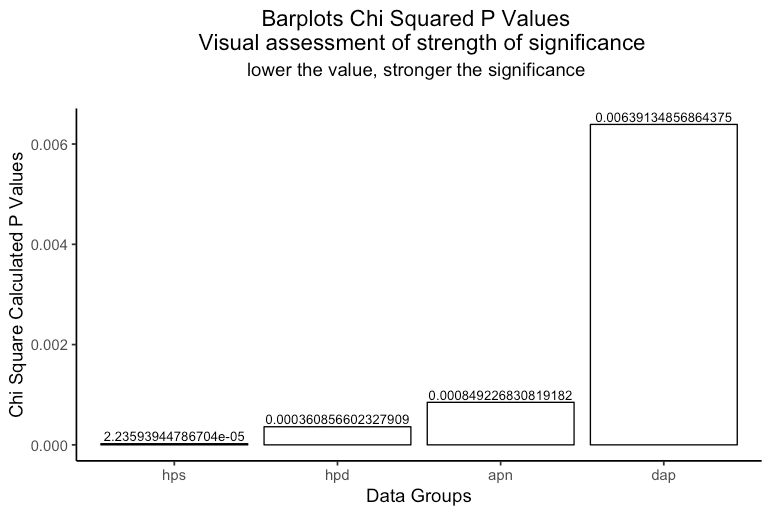 To determine the individual p values for each handover parameter, the chi-square test was used. The p values summarized in Table 2 and Figure 2 are statistically significant. As noted, the parameter of highest statistical significance after implementation of the ‘TAG’ protocol, was ’Handover plan sufficient’, (p value 0.00002). A p value could not be determined for the parameter ‘documentation of acceptance’ as there were no pre-TAG values present. The software package that has been used for conducting the entire statistical analysis was R Core Team (2017)18. After training all the ED doctors, in May 2018 a verbal survey was conducted to assess physician adherence to ‘TAG’ protocol and gather feedback. Questions included the following: Did you use the ‘TAG’ protocol? Would you suggest any further improvement for the ‘TAG’ protocol? Would you use the ‘TAG’ protocol if you were to move to another hospital? Of the 17 doctors in the ED, (58%) 10/17 used the TAG protocol for handover. Of note, when asked why it was not used by the remaining 7 doctors, the main reason cited was due to infrequent handovers. 100% (17/17) did not have any suggestions for improvement, and 100% (17/17) stated that should they move to another hospital, they would continue to use the ‘TAG’ protocol to guide handovers. The results from our study revealed that the concise, standardized ‘TAG’ handover protocol led to a significant improvement in handover practices. To our knowledge, this is the first of its kind protocol developed in Ireland for ED Physician handover. The ‘TAG’ protocol not only incorporates components usually revealed in a handover e.g. working diagnosis, but also integrates information that has previously been found to be lacking in inadequate handovers, namely, management, investigations, and disposition19. By including these elements in educational sessions and the laminated posters, the information communicated via documentation was significantly more complete, and provided a better guide to providing care for the handover patient. The ‘TAG’ protocol also improved communication of the accepting physician in both modalities of electronic medical charts and paper charts, demonstrating its value in EDs which might employ either form. The limitations of the present study include a modest number of handovers identified in both audit time periods. This might have affected the significance of the impact from the ‘TAG’ protocol. In this present study we did not document bedside physician-patient introduction as an element of handover, even though it was a part of the handover protocol. This is something we intend to re-audit in the future. As crowding and lengthy evaluations become the standard for an increasing proportion of Emergency Departments, the number of patient’s handover will likely increase. It is critical now more than ever before to ensure that handover’s supply valid and useful shared understandings between providers at transitions of care. It is in inadequate handoffs that safety often fails first 20. Errors in transition of care can occur as the departing physician could 14, 1. Pass incomplete or incorrect information, 2. Provide information in a disorganized or confusing manner, 3. Fail to provide a clear clinical impression (what is wrong) and plan (what needs to be done). The ‘TAG’ protocol addresses these details in the ‘Assessment and Game Plan’ component. The accepting physician could 14, 1. Misunderstand passed information, 2. Not listen (distractions/fatigue), 3. Prematurely close: jump to a conclusion because of patient or provider characteristics, 4. Failure to include important parties (medical student, nurses). The ‘TAG’ protocol emphasises on documentation of relevant passed information in addition to verbal handover. It also incorporates documentation of the physicians involved and other health care providers involved along with the disposition of the patient. Additionally, the ‘TAG’ protocol requires the bedside introduction of caring physicians as a completion of handover. We believe that clear documentation of these elements of handover will create a much safer and clear handoff. This study is unique in that it identifies existing gaps in current ED handovers and creates a standardized protocol which employs important parameters making a handover effective and adequate. Furthermore, it subsequently demonstrates a significant improvement in handover practices by impacting upon parameters critical to a sufficient handover. Improved handovers will contribute to a safer ED climate, which presumably will lead to decreased errors1. With continuity of staff education on the benefits of the ‘TAG’ protocol and the importance of it being adhered to, we anticipate long-standing improvements in handover practices. Based on our findings, we would expect that implementation of the ‘TAG’ protocol in other Emergency Departments could minimize errors during patient handover. 1) Camargo CA, Tsai CL, Sullivan AF, Cleary PD, Gordon JA, Guadagnoli E, Kaushal R, Magid DJ, Rao SR, Blumenthal D. Safety climate and medical errors in 62 US emergency departments. Annals of emergency medicine. 2012 Nov 1; 60(5):555-63. 2) Horwitz LI, Meredith T, Schuur JD, Shah NR, Kulkarni RG, Jenq GY. Dropping the baton: a qualitative analysis of failures during the transition from emergency department to inpatient care. Annals of emergency medicine. 2009 Jun 1; 53(6):701-10. 3) The National Emergency Medicine Programme: A strategy to improve safety, quality, access and value in Emergency Medicine in Ireland. June 2012. 4) Solet,D.J., Norvelle, J.M.,Rutan, G.H & Frankel, R.M.2005. Lost in translation and opportunities in physician-to-physician communication during patient handoff. Acad Med, 1094-9. 6) Bomba, D.T. & Prakash, R. 2005. A description of handover processes in an Australian public hospital. Aust Health Rev, 29, 68-79. 7) Kohn, L. T., Corrigan, J.M & Donaldson, M.S.2000. To Err is Human: Building a safer health system, The national Academies Press. 8) Wong, M.C., Yee, K. C. & Turner, P.2008. Clinical Handover Literature Review. University of Tasmania, Australia. 9) Pesanka DA, Greenhouse PK, Rack LL, Delucia GA, Perret RW, Scholle CC, Johnson MS, Janov CL. Ticket to ride: reducing handoff risk during hospital patient transport. J Nurs Care Qual. 2009; 24:109-115. 10) WHO Collaborating Centre for Patient Safety Solutions. Communication during patient hand-overs. Patient Safety Solutions. 2007; 1: solution 3. 11) JCAHO sentinel event alert, issue 26— delays in treatment. Sentinel Event Alert Advisory Group. Available at: http://www.jcipatientsafety.org/show.asp?durki9880&site155 &return9362. Accessed June 24, 2009. 12) Farhan M, Brown R, Vincent C, Woloshynowych M. ‘The ABC of Handover’: impact on shift handover in the emergency department. Emerg Med J. 2011 Jan 1: emermed-2011. 13) Marmor, Gerrard Oren, and Michael Yonghong Li. "Improving emergency department medical clinical handover: Barriers at the bedside." Emergency Medicine Australasia 29, no. 3 (2017): 297-302. 14) Cheung DS, Kelly JJ, Beach C, Berkeley RP, Bitterman RA, Broida RI, Dalsey WC, Farley HL, Fuller DC, Garvey DJ, Klauer KM. Improving handoffs in the emergency department. Annals of emergency medicine. 2010 Feb 1; 55(2):171-80. 15) Ebben RH, van Grunsven PM, Moors ML, Aldenhoven P, de Vaan J, van Hout R, Van Achterberg T, Vloet LC. A tailored e-learning program to improve handover in the chain of emergency care: a pre-test post-test study. Scandinavian journal of trauma, resuscitation and emergency medicine. 2015 Dec; 23(1):33. 16) Klim S, Kelly AM, Kerr D, Wood S, McCann T. Developing a framework for nursing handover in the emergency department: an individualised and systematic approach. Journal of clinical nursing. 2013 Aug 1; 22(15-16):2233-43. 17) Patient Safety Program, Department of Defense. Healthcare Communication Toolkit to Improve Transitions in Care. Falls Church, VA: Healthcare Team Coordination Program, TRICARE Management Activity; 2005. Available at: http://dodpatientsafety.usuhs.mil/files/Handoff_Toolkit.pdf. 19) Ye K, McD Taylor D, Knott JC, Dent A, MacBean CE. Handover in the emergency department: deficiencies and adverse effects. Emergency Medicine Australasia. 2007 Oct; 19(5):433-41. 20) Committee on the Quality of Health Care in America, Institute of Medicine. Crossing the Quality Chasm: A New Health System for the 21st Century. Washington, DC: National Academies Press; 2004:45.